This letter was written by Charles D. Delph (1836-1888), who initially served in Co. G, 17th Illinois Infantry and later transferred to Co. D, 8th Illinois Infantry. Charles was from Metamora, Illinois. 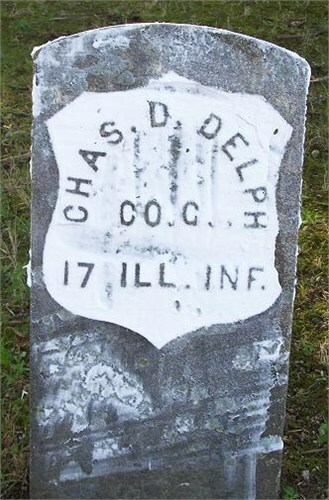 Charles was the son of William H. Delph (1799-1883) and Mary ? (1802-1872). He married Eliza (“Lida”) Frances (1840-1934) in 1867. He earned a living as a house painter in 1870 and as the Deputy of the County Treasurer in 1880. There is no envelope accompanying this letter and with the brief salutation “Friend Captain” is seems impossible to know whom Charles was writing to. The names of the other soldiers in this letter do not appear to be members of Delph’s Illinois units, however, so my conjecture is that Delph and the others were detailed to the Post Office Department in Vicksburg that was established after the city fell in under Union control in July 1863. Us fellows in the office intend keeping you posted of our actions as we still look to you as our friend and advisor and wish our actions laid before you for your criticism. We are something like boys at school and writing home for advice and to know whether we have done anything to merit a good name or not. Hill has been up home [and] comes back looking fat and fine. But unlike our friend [Edward Connell] Abdill,¹ as he says, he has not tasted the sweets of married life. We are all well and doing as well as could be expected under the circumstances. But are perplexed to death about our commutation papers &c. as Col. Clark don’t think us fellows worth the trouble of signing them, thereby almost compelling us to send them to you. But it seems like asking too much of you and we are somewhat backward about sending them. If you have anything for me to do with you, I am ready to march at a moment’s notice. Abdill has got a commission in the 11th Louisiana Regiment of A. D. But whether he will take it or not I cannot tell. I think Hill will be adjutant of his own regiment and as Steele is a Lieut. in the 9 La. of A. D., I am left all alone if the other boys go. We have splendid weather for the past month. I only hope for a continuation of the same. There is some excitement here about reenlisting. Some of the old regiments have gone into it in a body. The 46th Illinois and 12th Wisconsin have gone in to a man. But I think three years will do me for awhile at least. Mr. Pollock is a perfect gentleman and I like him very much. Give my regards to all the boys. ¹ Edward Connell Abdill (1840-1901) was married to Anna Bell Peters on 13 August 1863 — just four months prior to this letter. Abdill grew up near Perrysville, Indiana, attended Wabash College in Crawfordsville, and then enlisted Co. B, 11th Indiana commanded by Col. Lew Wallace. He participated in a number of hotly contested battles, including two which resulted in the capture of Fort Henry and Fort Donelson. He was afterward detailed for special mail service, having charge of the mails and dispatches at General Grant’s headquarters. This service he rendered so efficiently that in December, 1863, after the fall of Vicksburg, he was promoted to the rank of first lieutenant and adjutant of the One Hundred and Twentieth Indiana Infantry, and was designated by General Grant to bear to the north the official dispatches announcing the great victory. He was afterward made assistant adjutant general of the First Brigade, First Division, Twenty-third Army Corps. He took part in the battle of Vicksburg, was in the Atlanta campaign and in August, 1864, was honorably discharged because of physical disability. His record as a soldier was a most creditable one. He never faltered in the performance of any duty although he was often in most hazardous positions and his bravery and loyalty no one questioned. Mr. Abdill became a resident of Illinois following the close of the war in 1865 and opened a hardware store in Fairmount, where he carried on business for three years. Seeking a broader field of labor, he removed to Danville in 1868 and entered into partnership with his older brother under the firm name of Abdill Brothers, dealers in hardware. He continued in business to the time of his death and was numbered among the leading merchants of the city.